If you are looking for easy Christmas desserts, look no further! We’ve got some AWESOME ideas right here! While Christmas cookies are a perennial favorite, sometimes it’s fun to let the other Christmas desserts steal the show. Our family tends to go for the basics like pie, but why not go for something a little more interesting? 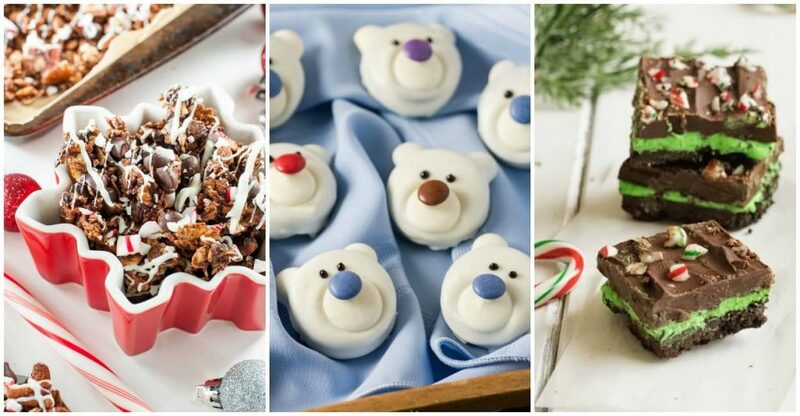 These are some fun, easy Christmas desserts that are sure to dazzle your family and friends. Of course some of them are cookies too, but there’s some other unique ideas here that will totally blow your mind. This easy crock pot candy is made in a slow cooker. Couldn’t get any easier than that right? The fun part about this is not only is it great to serve to your guests, but it can also be made as a gift for neighbors and coworkers, or even as a little take home treat for your guests too. While this dessert looks fancy, it’s actually made from simple, store-bought ingredients. If baking isn’t your thing, you can throw these together for an impressive Christmas dessert display without any baking skills at all! These dreamy peanut butter cups will leave you drooling and saying “Reese’s schmeeses”. Who needs the store bought ones when you can have these decadent delights? Another treat that would make a great gift, if you can manage to not eat them all before gifting. With just 3 easy ingredients, this simple recipe takes a cute twist on a traditional classic treat. There’s also a second variation that’s even more delicious and just as easy! They make a quick, last minute gift idea, perfect for the office potluck, or even a unique treat to leave out for Santa! Oh and of course these are no-bake, which makes it even better. Probably the epitome of easy Christmas desserts right here. Another great no-bake option, this one is perfect for tea (and peppermint) lovers! I mean, chocolate and peppermint, what’s not to love? These cute, festive Christmas tree brownies are just as much fun to make as they are to eat! So easy to put together, and bonus: after you cut out the trees there’s leftover brownie chunks you can throw into ice cream or milkshakes! It’s like a bonus treat! Another chocolate/peppermint combo? Duh! It’s Christmas time and that means chocolate and peppermint everywhere! This one is a little more advanced, but if you’re willing to put in the time they are a delicious showstopper! These are no ordinary sugar cookies! These are FANCY sugar cookies. Look at the fun snowflake pattern! The sparkle! The dragees! It’s a winter wonderland you can pop right in your mouth. I love a good, easy Christmas dessert recipe don’t you? I mean, what’s not to love? Christmas dessert usually entails some kind of chocolate and peppermint, which are pretty much the two best things ever right? Our family always had pie growing up. Pumpkin and apple. Occasionally we’d get fancy and someone would pick up a French Silk from Baker’s Square, but really that was the extent of our variety for a lot of years. Then eventually we branched out into Christmas cookies, and my mom always made pretzel rods dipped in chocolate. But I always wished we would have something a little more enticing. These fun options range from simple to fancy, but every single one of them looks totally delish, and would absolutely be a huge hit at your next holiday gathering. So, heed my warning. Don’t let your family suffer through lame Christmas desserts. It’s a special occasion, so it calls for something a little special, don’t you think so? What are your favorite easy Christmas desserts?